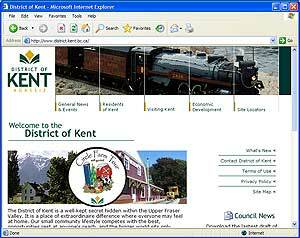 The District of Kent is a well-kept secret hidden within the Upper Fraser Valley. It is a place of extraordinaire difference where everyone may feel at home. Our small community lifestyle competes with the best, opportunities rest at anyone's reach, and the bigger world sits only minutes away. The District of Kent is a year-round playground where in the same day you can swim, tan, boat, or fish at one of the area's several lakes, rivers, and creeks, tee-off at one of the five golf courses, mountain bike and hike at Hemlock Valley Resort or one of the dozens of trails or mountains all within a short-distance drive.